This week I've had fun testing the new 'Groovy Guys Wallet' from Flossstyle. This wallet is suitable for guys of any age depending on your fabric choice. Lots of pockets, zippered & open for I.D, bus passes, credit cards or other essential cards or notes. Jessica writes great patterns, easy to follow layouts & cutting directions & when you download the pattern, there are really clear step by step photos demonstrating each step of the process to complete your project. I settled on this colourful moustache fabric for my trial pattern & picked up some ready made bias binding in orange to use on the edges. You only need to print off a single page for all the pieces of the wallet - yes folks - that's 1 page! - just keep the rest of the download on your computer to read through the steps. I trace my pattern pieces off any PDF download onto white toile (at only $1.50/mt from Spotlight it's handy to have on hand). Jessica is really savvy with how she does the layout, clearly indicating each piece & using a cute smiley face to show which way to cut your fabric according to the direction of the print. I used plastic for the see through window but you can make that pocket out of fabric if you like instead. I chose to use a sew on snap fastener for my wallet as that's what I had on hand & I think it works just fine, but you could use a snap closure or button as suggested in the pattern. I whipped up this 2nd wallet today as I really enjoyed using this pattern. I also wanted to show you a more 'sophisticated' version. The possibilities are endless to achieve different looks, just think, horses for the horse mad man, super hero fabric, bikes, cars, fishing, golfing.............the list is endless for whipping up wallets for the favourite men in your life to suit their hobbies or interests. 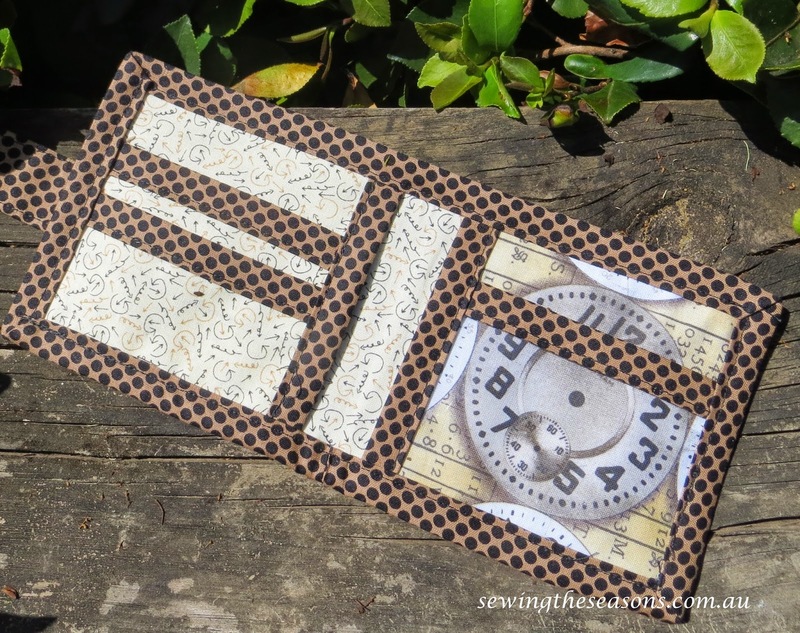 There has been an added extra option in the pattern that I will be trying soon, you now have the choice of adding a small zippered pocket on the outside of the wallet for coins (making 7 pockets in total). This step is included in the pattern you can download from Flossstyle. At only $3.00 The Groovy Guys Wallet is excellent value. It's worth taking the time to check out all Jessica's patterns, I have made the small & large bag from her Essential Trio pattern as well as a nurses scrub hat from the bucket hat pattern & plan on making lots more. You can also keep up to date by following the Flossstyle facebook page.